While our friend Ratty is an omnivore with places to go and habitats to conquer, the scaly pangolin is far more specialised in its culinary preferences. Similar to the other little oddball nature’s created, the aardvark, pangolins live almost exclusively on termites and ants. Pangolins are nocturnal, armour plated mammals that live in Africa and Asia. They protect their cuddly bodies with overlapping scales that have sharp edges and form a type of armour an ancient Roman centurion would have loved to possess. Like our friend the hedgehog, pangolins roll up into a ball when threatened by an inquisitive predator’s paw. They hunt for termites and ants at night, which they lap up with a long tongue that’s covered in sticky saliva (just like the aardvark). Pangolins have sharp claws which allow them to dig their underground burrows, where they spend the hot, humid days and hide from predators. 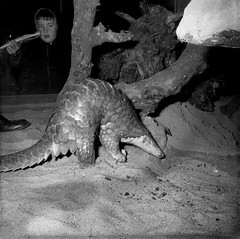 There are long-tailed, earth-dwelling and short-tailed, tree-dwelling pangolins living in both continents. The Asian variety has external ears and fluffy hair at the base of their scales, but the African variety has internal ears and lack scaly covering on the underside of their tails. Pangolins haven’t got teeth, but grind up their food thanks to swallowing small pebbles. Their powerful stomach muscles do the rest to assist digestion. The poor pangolins have, of course, one predator, who has hunted them relentlessly for their scales and tasty flesh: yep, our favourite villain, the human omnivore. While in Africa the pangolin is regarded as a yummy addition to a feast, in Asia the pangolin’s scales are used in “medicine”, following along the same rot as they come up with when grinding up elephant tusks or rhino horns to make an “aphrodisiac” elixir. It’s just a way of making lots of money out of idiots (mainly male), but sadly it hasn’t stopped “medicine men and women” from spreading this superstitious nonsense for centuries. Just like omnivores in nature can survive and conquer new habitats without any trouble, while a highly specialised creature loses out every time, the writer who closes his or her mind to other genres and other writer’s output will neither learn nor is likely to succeed in their own writer’s habitat. One thing all successful writers have in common is that they are ferocious omnivores when it comes to reading. They don’t disregard the humblest of genres, but cherry-pick the best ideas, writing styles and “voices” for their own work – that’s not stealing other people’s work, you understand, it’s being influenced by other writers’ good practice and learning from both their good and bad writing. We dismiss and disregard genres that don’t correspond to our own at our peril. I cannot even begin to describe how much goodness I have soaked up over the last 46 years of reading. I’ve seen how dialogue can be used to give character to my protagonists and antagonists; I’ve discovered that too much descriptive prose makes readers want to skip the page; I’ve learned how NOT to do things and how to critically assess other writers’ work in a constructive way that hopefully benefits both them and me. Being a reading omnivore as a writer keeps us on our toes, inspires us to look at our own writing with fresh eyes. The highly specialised writer, who never ventures out of their own comfortable underground burrow, will soon become stale, jaded and fade away from their readers’ minds, stifling any buying impulse in their book reading public. In that light my next post – prompted by an enquiry from a regular reader – will have at least one recipe from Mrs. Vampire’s Cook Book for the toothy Housewife (Fang press, published in 1586). Willow take note, you’ll be tested on it later! He or she is so cute. I love the way you have infiltrated writing into this post. Talking of writers dissing genres other than their own – about four years ago I was at the Crime Festival in Harrogate. On the stage were three very well known crime writers being rotten about J.K. Rowling and any books which had magic in them. It totally turned me off them. I felt that they were being totally narrow minded and to be honest I lost any respect I had for them as there was that terrible odour of jealousy pervading the air. I will listen to anyone who has something constructive to say -however, in this case, I thought I had lost my way and ended up in a playground. How very true! After I had donated my valuable free time to helping a fellow writer this week with her internet marketing, she had the nerve to tell me she hated fantasy fiction because she couldn’t be bothered with the “silliness” of it all…knowing damn well that I write for children and that I write fantasy fiction. She also put down ALL children’s fiction, knowing absolutely sod all about it. Closed minds…and she wonders why her book sales are stalling…when she meets her book buying public, she probably tells them off for daring to read anything other than the genre she writes in! As you say, one loses all respect for people like that. Glad you liked my post. Rant over. I really liked it. I wish people who want to say negative things about other people’s writing would learn to distinguish between objective and subjective. There are types of writing which don’t do it for me but I can still recognise their merit. I have no literary respect for people who make such sweeping generalisations such as those you have told me about. I agree. Not only did this woman insult me by taking up my time and putting down my writing, she had the nerve to tell me that I wouldn’t like HER book, it wouldn’t be my thing! How patronizing is that? 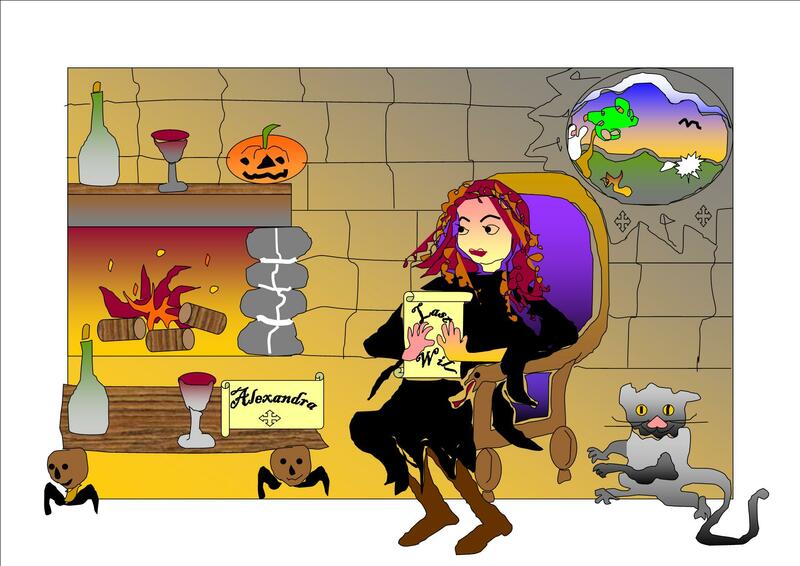 I write about vampires therefore I can’t like Jane Austen or Reginald Hill or Agatha Christie or Dorothy Parker or P G Wodehouse or George Eliot or Emily Bronte or…you name it! Grrr…hand me my weekend fangs and talons, I’ve got to rip out an ignorant soul! That is awful. I do not know why people act that way towards other people. What a very unusual animal, I sort of like him, so very different, what a shame that humans have found a way to use what this poor guy has. The scales are so very different than what I have ever seen before, and I just couldn’t believe it when I saw your photo of the coat, all I could do was shake my head, and ask that question why? I know, it’s disgusting, isn’t it – at that time in human history we’d already been manufacturing chain mail for centuries out of metal, so need to pluck poor animals of their natural defences.